Observing the façades of the Rode house, we might think that Mauricio Pezo and Sofia von Ellrichshausen drew their inspiration from the conformation of the land in Chile, a narrow tongue of earth about 4300 kilometres long squeezed between the Pacific Ocean and the Andes. In the photos taken by the Concepción-based studio, Casa Rode appears hermetically sealed off on its western side, while open and curious about capturing the landscape toward the horizon to the east. This reflection demonstrates the awareness of the importance of the site of architectural experimentation of this small Chilean studio, which approaches its buildings on a case-by-case basis, especially when it comes to designing homes. The Rode house is on one of the islands in the Chiloé archipelago, in the region of Los Lagos. The house faces the inland sea, rising out of a wild, uncultivated meadow with the pride of a building in which the human presence challenges the natural elements. On first glance, not only the Rode house but all the Chilean duo’s residential buildings, generate amazement, probably because of the way they trigger conflict with their surroundings. They look like imaginary buildings which are by no means designed to be lived in, in which the rooms are arranged around a functional core supported by distribution spaces. They are surrounded by a deep-seated sense of spirituality, almost as if the architects wanted to build a monument to living rather than a true home. This abstraction of the concept of home is not weighted down by practical requirements such as a guest bedroom or a garage; all the space, both inside and outside, is treated in the same way; there is no separation between public rooms open to guests and utility areas. All functions take on an absolute, existential value, rather than being defined in relation to contingent requirements. The forms of the Rode house are also geometric abstractions. Mauricio Pezo and Sofia von Ellrichshausen define this type of architecture as “the interrupted encounter between a cone and a cylinder”. In the layout, this gives rise to a single semi-circular sign, in the thickness of which the inside of the home is built. Their beauty and the enigma they conceal, here as in all their other constructions, perhaps lie in the strict subordination of functions and spatial programmes to the laws of geometry. Almost as if they were attempting to create a new world, and a new way of living in it. This different method does not involve comfortable scanning or distribution of space by functional association or dissociation. 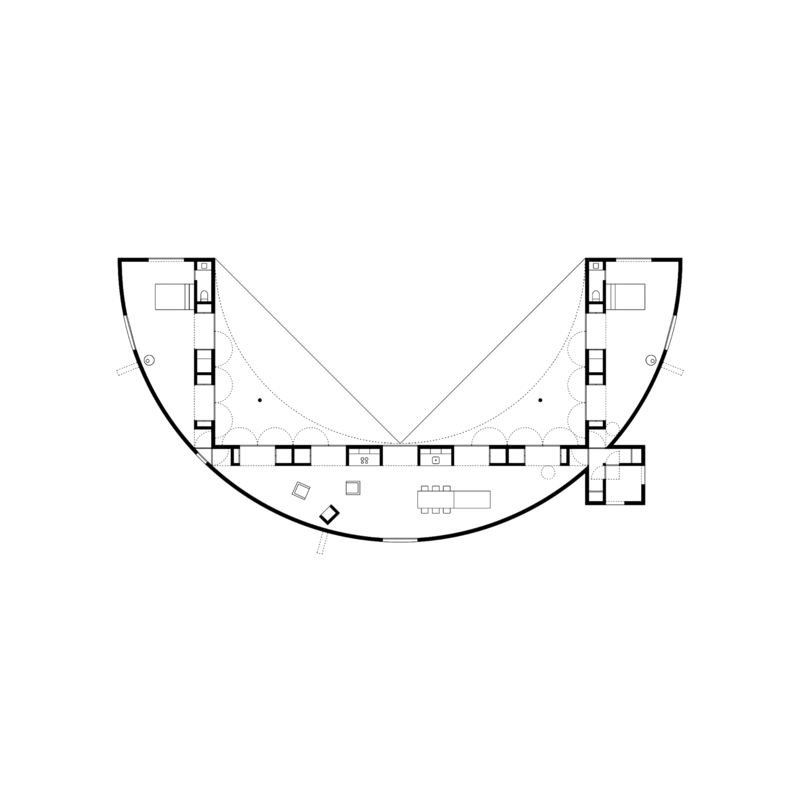 Like the Loba house, built on a staircase, or the Solo house, built in a ring around the swimming pool, the Rode house is a semi-circumference built around a courtyard, and the circulation space coincides with the living space itself. In this shallow semi-circular interior space is a wooden frame of walls and doors with a U-shaped layout, into which the architects graft the toilets and utilities, carefully concealed, and which divides the space into four : two smaller rooms become the bedrooms, while the bigger room becomes the living room and the uncovered space in the centre is the courtyard. The house is made entirely out of local timber. 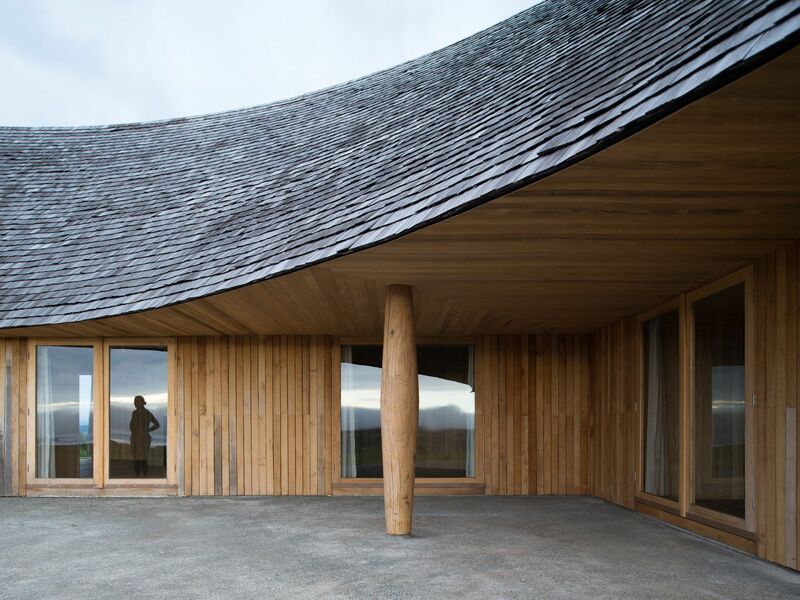 Wood completely covers all the walls and ceilings, and even the simple wooden furniture, while outside, shingles cover the steeply sloped semi-circular roof. Wood and cement are the studio’s favourite building materials, used in contrast or alone as they are here. Two pillars symbolically bear the weight of the entire roof, which is actually supported by a rectangular frame grafted into the semi-circle of the layout. As in many of their previous projects, the architects take great pains to ensure symmetry, to the point that in the photographic perspective shots taken by the architects (in which they themselves appear, as usual), the interiors are almost maze-like due to the uniformity of the surfaces and the rhythm of the windows.